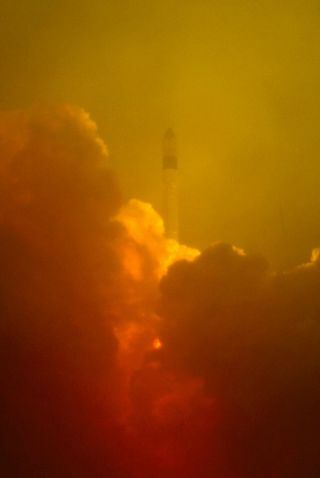 A Rockot launch vehicle blasts off on Nov. 1, 2009 with the Europe's Proba 2 and Soil Moisture Observation Satellite (SMOS) from the Plesetsk Cosmodrome in northern Russia. Amodified Russian ballistic missile successfully launched a $464 millionEuropean science satellite Monday to investigate Earth's water cycle bymeasuring moisture levels in soil and salt concentrations in the world'soceans. "I'm really happy andrelieved," said Achim Hahne, project manager for the Soil Moisture andOcean Salinity satellite. The SMOS satellite willspend the next three years creating the bestmaps of variations of moisture and salt in land areas and the open ocean.This data will help weather forecasters, climatologists, and water resourcemanagers better predict changes in the water cycle. "SMOS is known asESA's water mission," said Mark Drinkwater, head of the European SpaceAgency's mission science division. "It's going to help us understand thecomplexities of the water cycle on Earth. Jean-Jacques Dordain, ESAdirector general, praised the agency's role in space research focused on planetEarth. "ESA is certainly thespace agency of the world making the best efforts for Earth science and climate(research) and this is a new contribution to the understanding ofclimate," Dordain said. SMOS and another satellite,called Proba 2, rode into space on the power of a retired ballistic missiletaken from the arsenal of the Russian military. The Rockot launcherflickered to life and roared off its launch pad at Plesetsk Cosmodrome at 0150GMT Monday (8:50 p.m. EST Sunday), disappearing into fog and low clouds in thepredawn hours in northern Russia. The 95-foot-tall rocketpitched northward from Plesetsk, flying over the Barents Sea as it jettisonedits first stage, payload fairing and second stage within five minutes ofliftoff. The Rockot passed out ofcommunications range with ground stations moments later, leaving groundcontrollers in the blind until the vehicle appeared again over theHartebeesthoek communications site in South Africa. By that point, the 1,451-pound SMOSsatellite was separated from the Rockot's Breeze KM upper stage andexecuting programmed commands to deploy the spacecraft's two solar panels. "Currently, we areanalyzing the telemetry we have received, but we can say the satellite is ingood health and the solar panels have been deployed," said FrancoisBermudo, SMOS project manager at the French space agency, CNES. SMOS was planned to bereleased in an orbit ranging in altitude from 465 miles to 476 miles, with aninclination of 98.4 degrees. Spacecraft separation occurred at about 0300 GMTMonday (10 p.m. EST Sunday). The Breeze upper stagecoasted through space for another circuit of Earth before the $27 million Proba2 secondary payload was cast free of the rocket. The 287-pound miniaturesatellite will demonstrate 17 new space technologies and carries fourexperiments to study the sun's impact on space weather during its two-yearmission. Proba 2 carries test components that could be used on future missions,including the BepiColombo Mercury probe and the Solar Orbiter spacecraft. "With Proba 2, we arepreparing for missions 10 years from now," Dordain said. SMOS will unfurl threeprongs of its Y-shaped antenna Tuesday before the instrument is activated fortesting over the next few weeks. The L-band MIRASinstrument, resembling the rotors of a helicopter, is a first-of-a-kind payloadcomprising 69 individual antennas stringed together in an inferometer-likearray to maximize the sensor's sensitivity. Each of the small antennaswill measure faint radio signals emitted by Earth and an on-board processorwill bind the data together before sending the packets back to scientists onthe ground. The MIRAS radiometer wasbuilt by EADS CASA in Spain. Development of theground-breaking technologies required for such an instrument began in 1992. Theengineering design was finally mature enough for the SMOS mission to beformally proposed in 1998. "MIRAS is really aradio telescope looking down instead of up," said Manuel Martin-Neira,payload engineer on the SMOS mission. "But to gather an image of usefulresolution would require a classical antenna of at least eight meters (26 feet)across, far too bulky to fly on the launcher and satellite platformavailable." "When we think aboutit's sensitivity, we can think about measuring on the order of one teaspoon offresh water in the upper layer of soil," Drinkwater said. Soil moisture is a keyfactor in determining humidity in the atmosphere and the formation ofprecipitation. "Water is the maindriver for the exchanges between the atmosphere and the soil," said YannKerr, SMOS lead investigator at CESBIO, a French space research agency. "Monitoring these changes help us have better weather forecasts and bettermonitor climate changes." Officials hope data fromSMOS will be fed into numerical weather prediction models to aid meteorologistsin making more accurate forecasts. "Being able to measureaccurately the water available in the skin of the Earth helps us have a betterunderstanding of the future weather," Kerr said. Soil moisture is alsoimportant for researchers studying plant growth and vegetation distributions. "With SMOS, it will bethe first time that we have measured soil moisture with an accuracy of 4percent, which will allow us to get 10 to 11 classes of soil wetness,"said Matthias Drusch, SMOS mission scientist. SMOS will create maps ofsoil moisture in 30-mile-wide blocks and maps of ocean salinity in boxes 120miles across. Ocean salinity data fromSMOS will tell scientists how the atmosphere and oceans interact. Scientists will also gainnew insights on ocean circulation, one of the most important drivers of worldclimate. Like conveyor belts, circulation patterns transport warm water to highlatitudes and cool water to low latitudes, moderating the planet's climate. "It helps to maintaina balance of temperature across the globe," Drinkwater said. The temperature andsaltiness of the water help determine ocean circulation patterns. "That's why SMOS wasreally crafted as a mission to get a look at how the salinity varies globallyfrom one region in the ocean to another, since it's the variations that reallydrive the circulation," Drinkwater said. SMOS data will be used tomake weekly, seasonal and annual maps of salinity and moisture levels. "The ability of SMOSis really helped by the fact that we can map the whole globe every fewdays," Drinkwater said. "We accumulate data over intervals of twoweeks to a month, and we can make a global picture of the salinity in gridcells around the globe on those intervals of time." In its ocean salinityinvestigations, the two-dimensional SMOS radiometer can detect one-tenth of agram of salt in a liter of water. All of these measurementsoccur as SMOS orbits nearly 500 miles above Earth. "That's amind-boggling thought," Drinkwater said. SMOS will be the firstsatellite capable of gathering global observations of soil moisture and oceansalinity, building on previous point measurements made by aircraft, ships andbuoys. NASA is planning twosatellites, Aquarius and SMAP, for launch in 2010 and 2014 to make further measurementsof salinity and soil moisture, respectively. The SMOS mission's pricetag of about 315 million euros, or $464 million, was divided between ESA andCNES. CNES will conduct theday-to-day operations of the satellite, while ESA will be responsible formanagement of the mission and the ground segment. Normal science activitiesshould begin about six months after launch, starting two-and-a-half years ofactivities to map the distribution of moisture in soil and salt in ocean water. But SMOS could last muchlonger. SMOS is the second of ESA'sEarth Explorer missions, which were conceived to follow up on observations ofthe agency's flagship Envisat satellite launched in 2002. The gravity-mappingGOCE spacecraft launched on another Rockot vehicle in March. The CryoSat 2mission, a replacement for a satellite lost in 2005, is due for launch on aDnepr rocket in February to probe the polar ice caps. "There are manyaspects of Earth we don't know about to the extent necessary. For example, thegravity field, soil moisture, ocean salinity, to give only three examples whichwe are going to measure," said Volker Liebig, director of ESA's Earthobservation programs. "I like to see thethree missions as very powerful triplets to help address the key climatequestions that we have today," Drinkwater said.